Oracle SOA Unit Test Automation. Testing a Complex Business process could get more complex than the Business Process itself. 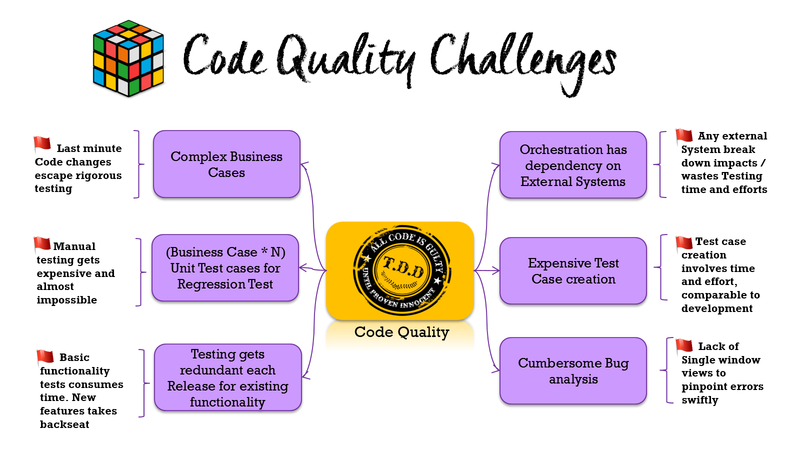 The Code Quality challenges are depicted below. While Automated Build Tools like Jenkins and Hudson ensure that the code check-ins are devoid of any compilation issues. We can also ensure that the Check-ins are not breaking the existing functionality, with the approach discussed below. Oracle SOA Suite provides customized form of JUnit Test Case functionality. The testing Methodology is as below. Create Unit Test Case Configuration (XML) in JDeveloper GUI, with Sample Requests and expected Outcome. The Request and Response can be evaluated for Partner Links and Composite IO. The Assertion Validations are provided for either whole request or response fragments, to validate the Test Case Result. The Unit Test cases are executed from EM console - Composite Dashboard - Unit Tests. It is nothing but ant script executing the Test Cases based on the Configuration XML created above. The Unit Test case results are returned back as XML Output. Oracle SOA Unit Testing ‐ As automated nightly builds. 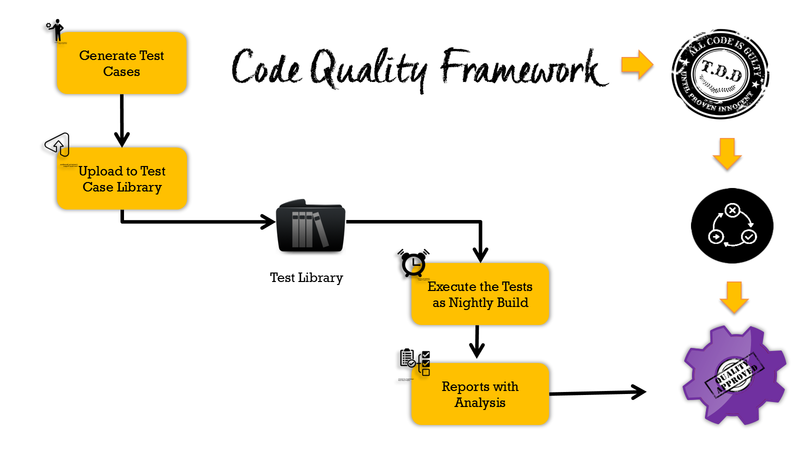 The Process of Unit testing can be automated as well, so that everyday morning we know we have a report on Code Quality, just like Build automation. The approach is depicted as below. The Test Case Configuration XML file, which gets created from JDeveloper UI, is a collection of Requests and appropriate Response to be validated. This will be based on existing manually tested Reference Composite Instance. We can generate the XML file, by parsing the Audit trail of the Reference Composite Instance. The Unit Test Case execution can be done as Ant Build, which could be further scheduled as Nightly Builds to check Code‐Check‐Ins. The Test Result Output XML from Ant Build can be leveraged for generating Test Report. Else, we can also adopt a similar approach of scanning the Audit trail of the Resultant Composite Instance and form the report, matching the Results with the Test Configuration Responses. 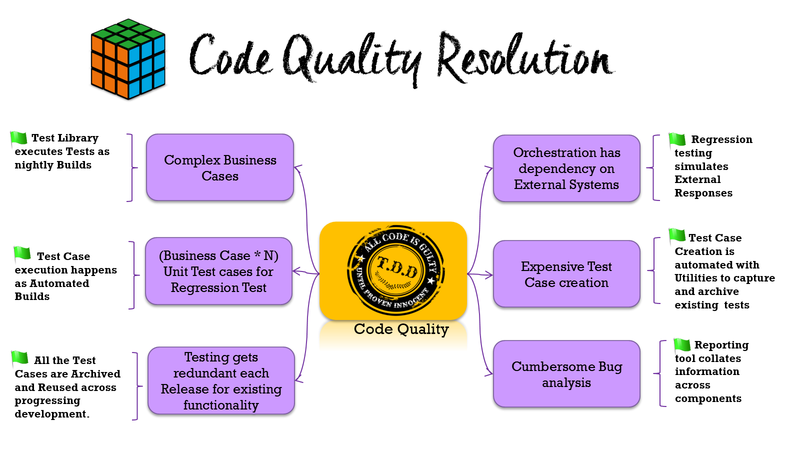 Henceforth, the above approach, resolves the Code Quality challenges as depicted below. Let us now focus on implementing the approach. Execution Step 1 : Generate Unit Test Cases. The Unit Test Case generation involves the following steps. Consume the Composite Instance details, like the Composite ID, Process Name so as to find the Instance programmatically. The Audit Trail details are retrieved as explained in separate Post. The Audit Trail Data pertaining to the Composite Instance, will be parsed for the Request Responses for the Service and Partner Links and other necessary details, required to generate the Test Case. The Code Snippet is provided below. //The Entry method for populating Test Case. //Composite Instance Metadata populated in searchResult. //GeneratorResponseBean stores the data required for the Test case config generation. // The WSDL optionally required if you would like to perform external simulations of systems. This is more of an ideation code rather production ready. The Code parses the Audit Trail with String manipulation to keep it simple and swift. The XML DOM can also be leveraged for Audit trail parsing. The Test Case Source data will be converted to Unit Test case configuration and gets added to the SOA Application Source. The Code Snippet is provided below. //Entry method for Test Case Files Generation. Execution Step 2: Execute the Test Case as Automated Build. The Ant Task executes the Test Case for the BPEL Project passed. The java.naming.provider.url will be of the format t3://host:port/soa-infra and java.naming.factory.initial=weblogic.jndi.WLInitialContextFactory The Ant Task can be configured to execute from Jenkins, scheduled as per needs. Execution Step 3 : Generate Test Report. The Ant Task generates the report. It has few limitaitons, like the Assert Comparison feature from the product has limited options. In case we want to add custom Assertions and override the standard comparison, we can generate a similar report by accessing the Audit trail of the Composite. We can also add more feaures like direct access link to the Composite Instance Flow and Flow trace for easy analysis and debugging. The XSL file transforms the above report to HTML with simple XSL. The HTML file can be linked to the Jenkins Build Result.